Cook & cool the rice thoroughly. In a large wok heat vegetable/sesame oil till hot. Add cabbage, shallots, a pinch of sugar & stir-fry briefly. To this then add cooked & cooled rice & toss for a while. Now add light soya sauce, rice vinegar & keep tossing on high heat. Reduce the heat to med. if desired & keep tossing & mixing occasionally. Now add the reserved shallots & toss again. Season with salt & pepper & keep aside. Break the eggs into a bowl & lightly beat the eggs with a whisk or a fork. Heat a frying pan with one tsp. oil on med. till hot. Make sure the oil is evenly smeared on the entire pan. Gently pour the beaten eggs evenly in the pan. Roll the pan gently so that it spreads evenly on the entire pan. Let the egg set for a few seconds & then flip on the other side to cook. Do not over cook. Just let it set so that it is soft & lightly springy. Lift it out from the pan & cut into long strips or slice as desired. Lightly mix the pieces of the omelette into the fried rice. Before serving toss it again on high heat. Serve piping hot garnished with a generous helping of sliced spring onion greens. You can add a mix of vegetables of your choice. Use of sesame oil helps in enhancing the flavour of the dish. 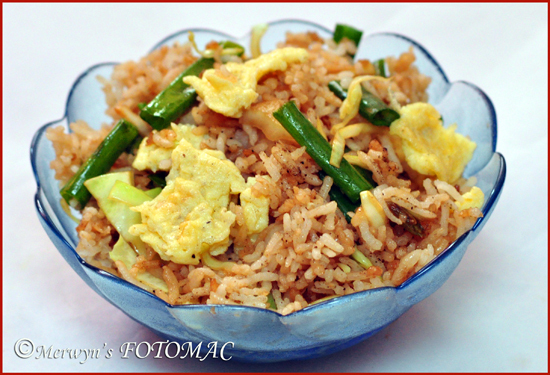 For a slightly moist fried rice use few tsps. of fresh vegetable stock or crushed vegetable stock cubes; as per your preference. It is extremely important that you don’t overcook rice; grains must be separate after cooking . The grains should be cooked but must have a bite. In case the rice has too much starch then pass quickly through running water. Cool rice helps to retain the whole grain while stir-frying. The wok must be really hot for stir-frying & tossing. Avoid prodding the rice with a spoon; try & toss the rice to retain the grain. If you do not have a large wok, prepare it in smaller batches.